In this Japanese name, the family name is Mishima. Yukio Mishima (三島 由紀夫, Mishima Yukio, January 14, 1925–November 25, 1970) was a Japanese writer, poet, playwright, actor and film director. Mishima studied at the elite Peers School (学習院, Gakushuin). In 1941, Mishima wrote his first notable story. In Hanazakari no Mori (花ざかりの森, "The Forest in Full Bloom"), he described a feeling that his ancestors lived within him. 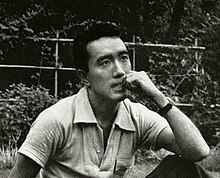 Mishima graduated from the University of Tokyo in 1947. Mishima worked in the Japanese Ministry of Finance. At the same time, he was writing. In 1949, he published his first major novel, Confessions of a mask. In a summary based on writings by and about Yukio Mishima, OCLC/WorldCat lists roughly 1,700+ works in 4,400+ publications in 40+ languages and 56,600+ library holdings. ↑ 2.0 2.1 2.2 Nussbaum, Louis-Frédéric. (2005). "Mishima Yukio" in Japan Encyclopedia, p. 640. ↑ Shabecoff, Philip. "Mishima: A Man Torn Between Two Worlds," New York Times. November 26, 1970; retrieved 2012-6-8. ↑ WorldCat Identities: Mishima, Yukio 1925-1970; retrieved 2012-6-8. This page was last changed on 31 August 2017, at 15:19.